Last December, my brother got married in a short-notice ceremony in Las Vegas, where my folks were wintering. There was an epic snowstorm that prevented climbing that day, so he and his (now) wife decided to get married instead, with just our parents in attendance. Last night was the slightly belated party, here in Wilson, and it was great. As a kcatalyst is fond of observing, weddings are the one party that everyone in your life is going to make a big effort to make it to -- this has always stood out to me as one of the big motivations to have a wedding! This was such a low-key affair, it wasn't like that, but still, a lot of people I haven't seen in 15 or 20 years showed up, and it was amazingly fun to see them and catch up. 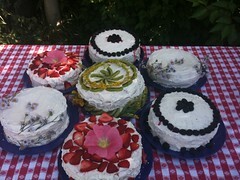 It was a classically chill and fun Magpie Acres kind of party, with Wyoming burgers and potluck and 7 cakes (above) made by me and the bride and music by a local musician and a bonfire. I got to catch up with my first grade teacher, a bunch of my favorite friends of my parents from my childhood, a lot of people who are doing interesting things and who reassure me that it's possible to make a good life that isn't remotely conventional, in a whole slew of ways. See: that's the kind of wedding that seems authentic and genuine to me. It's a celebration of the couple and their friends and the "tribe," rather than the "pretty, pretty princess day" that seems to be so popular. Is that cake in the middle garnished with gherkins? Yes, it is a traditional carrot cake with hand-sliced gherkins. And thanks for the reminder that good lives can be completely unconventional. I've been a little stuck in a rut of uncertainty about my own unconventional life lately.